Ron Shuffield, president of Esslinger-Wooten-Maxwell Realtors says that "South Florida is working off of a totally new economic model than any of us have ever experienced in the past." 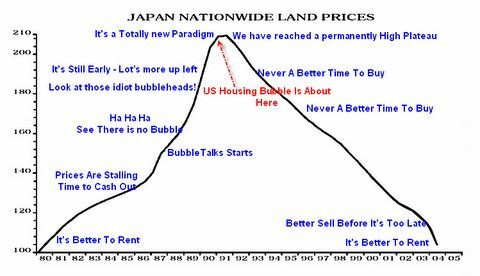 He predicts that a limited supply of land coupled with demand from baby boomers and foreigners will prolong the boom indefinitely. 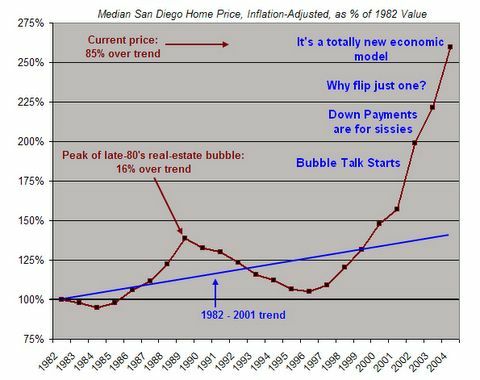 "I just don't think we have what it takes to prick the bubble," said Diane C. Swonk, chief economist at Mesirow Financial in Chicago, who was an optimist during the 90's. "I don't think prices are going to fall, and I don't think they're even going to be flat." "I look at this as a short-term investment," said Mr. Farquharson, 36, who works for a venture capital firm, "and plan to unload it as soon as things look dangerous." Now there's a laugh. By the time it looks dangerous will there be anyone looking to buy? Doesn't it look and feel dangerous now? Is he blind or am I? MoneyPenny on Silicon Investor writes: "I live in this fantasy land. SW Florida seems to believe that we are immune from any financial difficulty. I have a friend that is positive that real estate values will appreciate 20% a year for the next 10 years as Baby Boomers move to Florida. .... I stand in amazement but I am enjoying the amazing increase in my interior design business. I have never seen anything like it in my long career (37 years)." Free money shills are everywhere: "Who Else Would Like to Learn How To Make Over $100,000, in 6 Months, With an Investment In Preconstruction Real Estate?" Who needs models? "The demand for the product was so high that we could actually sell it without having a model to show them," said Glen Stegeman of Paseo Home Sales. "It is kind of crazy. It's a good crazy. Obviously the demand is there," said Stegeman. 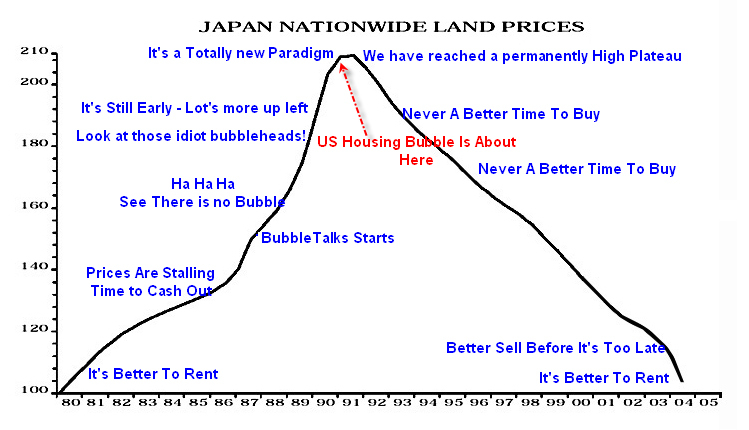 The real estate bubble is not just limited to the US either. Brad Sester talks about the Trans-Pacific Real Estate Bubbles in China and how that is related to the housing bubble in the US. Is this really a totally new economic model or is it just the same old story: Mammoth greed and speculation fueled by easy money and an intense belief that "nothing can possibly go wrong"? In the meantime I am getting "hate emails" from people bragging about flipping in Florida. I guess we should all retire and flip houses, sight unseen of course. Who needs to see a model? Heck, any plot of land with a 5 year plan to "build something really nice" on it is all it takes these days to get people interested. Then again, perhaps random taunts out of the blue from "true believers" are another sign of topping action. Talk of "new paradigms" or "new economic models" has been associated with every major bubble in history, typically near the peak. Wasn't it just 5 short years ago that Greenspan proclaimed the "productivity miracle" and everyone was counting "clicks" on dot coms as the "new economic model"? Just as soon as I finished writing this post, I found a new quotation to add. Gregory J. Heym, the chief economist at Brown Harris Stevens, is not sold on the inevitability of a downturn. He bases his confidence in the market on things like continuing low mortgage rates, high Wall Street bonuses and the tax benefits of home ownership. "It is a new paradigm" he said. Scroll back up and take a look at that first chart again. Current talk of "New Paradigms" and "New Economic Models" should tell you exactly where we are and where we are ultimately headed.